Steven (Chicagoland, United States) on 12 April 2010 in People & Portrait and Portfolio. Perhaps it was a few drinks or two...or three....that got college students feeling limber and warming up for the main act. 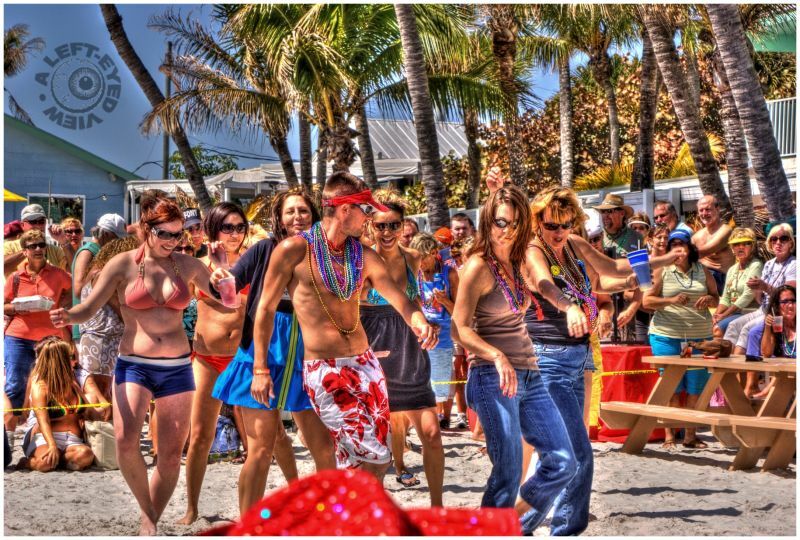 The Cincinnati Fire Department holds an annual fundraiser where they share the beach with the Spring Breakers. After ten shows at the Lani Kai Resort on Fort Myers Beach, the firefighters collected more than $6,000 for The Pete Renner Foundation, a charity in Lehigh Acres, Florida. Beach boys and girls at the top ! Great HDR ! The HDR here works really really well ! Oh yeah this is mad Steve, I like it. All done in Photomatix or are you using any other tools yet? @Curly: This is processed with Photomatix with some touchup in PhotoScape. They certainly were having fun! They seem to be having fun as do the spectators. A very cool shot. Somebody's having a great time out there, on both sides of the camera.